Toyota Mark X Zio (ANA10/GGA10). 2007–13 (prod. n/a). 5-door wagon. F/F, F/A, 2362 cm³ (I4 DOHC), 3456 cm³ (V6 DOHC). Attractive crossover wagon, replacing Mark II Blit, bearing the Mark X moniker but, in fact, not related to the sedan. 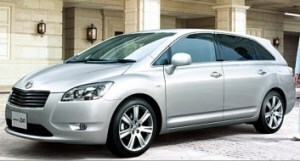 Platform, in fact, related to Toyota Auris (E150). Zio, officially ZiO, stood for Zone in One. Considered less roomy than true minivans such as the Honda Odyssey (RB1), with a cramped third row. Some technical improvements for 2010, and price reductions on some models in 2011.